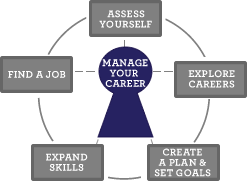 The Manage Your Career section helps you learn ways to take charge of your life and career. Build a Foundation helps you learn about the world of work. It also gives you tips on how to take charge. Move Forward helps you to keep managing your career. What is career management? It means you are in charge of your life and your career. Managing your career means that you think about what is important to you. You look at the steps to make your career goals happen. You actively look for ways to improve your job skills. Why should you manage your career? When you take charge, good things will happen. You will be more valuable to your employers. You will find more opportunities to move up in your jobs. You will have more confidence and self-respect. You will show your children how to succeed in their school and careers. You get to feel like your own person. You will learn to handle change and crisis. The need for career management is ongoing. This Job Seekers Guide shows you how to take charge of your career. You'll create a career plan. The exact actions in your plan depend on your own situation. You can use your career plan throughout your work life. Go to the Build a Foundation section to get prepared. The New World of Work will help you understand employer’s expectations.